The words “Laser Tracker” don’t do much to help many people understand our dimensional metrology services, so for this blog post we are going to help you better understand how we can achieve some precision even when we are not working in a laboratory or even a controlled environment. We are able to construct stable control points scattered throughout our working space. These points are placed in such a way that they fully surround the area in which the alignment is taking place. As the measurement process takes place, we refer back to these control points confirming that the readings we are getting are checked against our original data. Upon completion of the project we always close the loop, confirming a final degree of measurement error by checking back into these control points. Often the level of error is about one thousandth of an inch, well below the tolerance of most machine installations! Most people think of “up” and “down” in reference to gravity, but with our dimensional metrology equipment we are never restricted to the orientation of gravity. We can measure things that are suspended above the ground or even things that are installed vertically. For example, in the power industry, turbine alignment can not be calculated using gravity because the third axis is not level according to the world. Instead it depends on the orientation of the bore, which has nothing to do with gravity, thus it is a floating orientation. 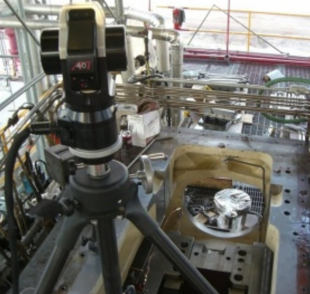 Different from optical alignment, which is gathered using mechanical processes, our laser tracker method uses a laser to interact with your machinery. The tracker stays stationary and feeds data, read by a reflecting prism, back to a computer, which then processes that data into a three dimensional software designed to help us make fast alignment calculations. The digital process means your data is gathered faster and the alignment process takes less time to perform.